Issued by the Catholic Bishop's Conference of the Philippines through the Episcopal Commission for the Doctrine of the Faith headed by by His Eminence, Orlando B. Cardinal Quevedo, D.D., O.M.I. 1. The Faithful should be encouraged to continue their devotion to our Mother mary, Mediatrix of Grace. The belief and the practice go back to the 4th century. 2. The Faithful are to be instructed that the devotion should be separated from the reported apparitions in Lipa in 1948. 3. THe Faithful are to be told that on April 11, 1951 the Holy Father (Pope Pius XII) approved the decision of the body, established by the Vatican to investigate the alleged apparitions. The decision was that the alleged apparitions were of "non-supernatural origin and character" and were not to be believed. 4. The Faithful are to be clearly informed that on December 11, 2015 the Congregation for the Doctrine of the Faith issued a decree, approved by our Holy Father Pope Francis, reiterating the 1951 decision and thereby nullifying a local decision that the apparitions were worthy of belief. 5. 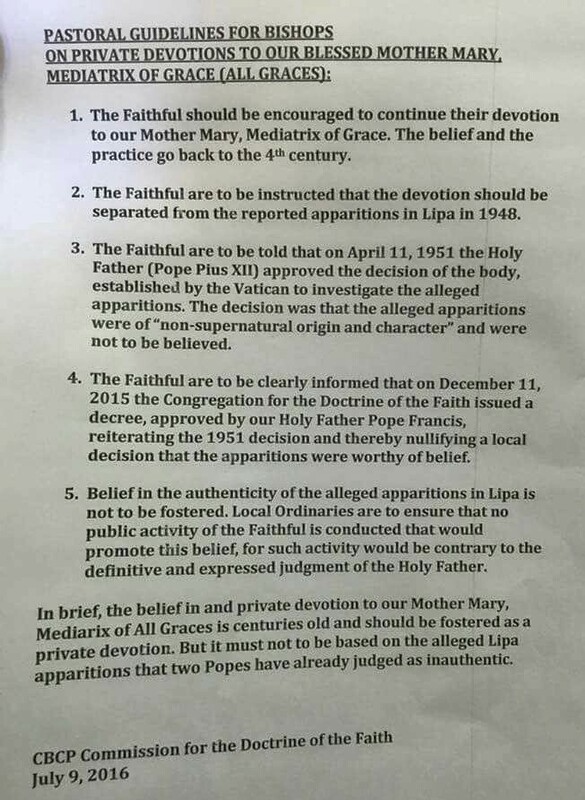 Belief in the authenticity of the alleged apparitions in Lipa is not to be fostered. Local Ordinaries are to ensure that no public activity of the Faithful is conducted that would promote this belief, for such activity would be contrary to the definitive and expressed judgment of the Holy Father. In brief, the belief in and private devotion to our Mother Mary, Mediatrix of All Graces is centuries old and should bbs fostered as a private devotion. But it must not to be based on the alleged Lipa apparitions that two Popes have already judged as inauthentic.